The North American International Auto Show (NAIAS) saw the unveiling of the production version of the 2016 Infiniti Q60 sports coupe, the concept for which we saw last year at Detroit. A new V6 engine, exterior design, and improved chassis are highlighted. The newly-redesigned 2016 Q60 is lower and wider than it was before. Its new design language is in line with the updates made for the Q50 sedan with strong lines along the hood and body. The bodywork is accentuated by large wheels, thin tires, and tight wheel wells with very little gap. A few hints of the outgoing Q60's design, including the accented brake cooling vents and curved rear pillar, can be seen. The base engine for the 2016 Infiniti Q60 coupe will be a turbocharged 2.0-liter four-cylinder that outputs 208 horsepower and 258 pound-feet of torque to the rear wheels. The upgraded engine is a twin-turbocharged V6 that outputs 400 hp and 350 lb-ft in rear-wheel or all-wheel drive. A seven-speed automatic transmission runs the drivetrain from the engine. The next-generation of the company's Adaptive Shift Control for the transmission and Direct Adaptive Steering for the V6 models. The new DAS can make up to 1,000 steering adjustments per second to the Rack Electronic Power Steering system. For the Q60 coupe V6 models, a new chassis and suspension system have been developed. This is an upgrade from the previous Dynamic Digital Suspension system used on the previous generation of the Q60. Software and hardware upgrades changes the adjustable dampening and shock absorption with driver-selectable modes. Inside, the new seating is made for premium-level sport bolstering and better comfort. Active Noise Cancellation is standard in the new Q60 as well, cancelling out negative engine noise frequencies coming into the cabin. Acoustic glass is also standard. Bose created a new 13-speaker Bose Performance Series sound system for the Q60 coupe to round things off. 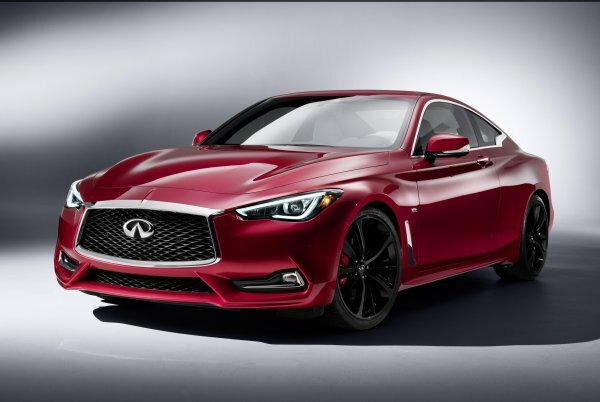 The 2016 Infiniti Q60 will enter select international markets later this year.